Finale--Business Is Different For You: LEAD! Final Business Is Different for You: Time to Lead! So, by now, you see that as a “transformation artist,” here to empower people, you are a different type of entrepreneur, and so you need to do business differently. You need to stand out differently, and yesterday, I showed you how: interrupt long-held patterns your audience is holding on to tightly. It grabs that brain’s attention and it can’t look away. This is the domain of the thought leader. But, as I said, you can’t just rattle cages: you must inspire those within them to want to fly: that’s what the inspired leader does. Your destiny is to become an Inspired Thought Leader. These are the elements I work deeply on with my clients in my 7-session program, The Powerhouse Method (TM). Each one is a message in and of itself (and written as a single sentence)—but then we weave them together into a final argument, or Inspired Thought Leader message. Let me give some details on each. Future Visioning. As a thought leader, you must be both a “futurist” and a “visionary.” As a futurist, you have your finger on the pulse of today’s culture and trends and you make predictions about what your market will want and be able to do over the next 5-10 years. As a visionary, you see a future for your market if they rise to their potential. It’s a future, a vision, they have not seen for themselves and want very much to aspire to. When you frame a picture of the future and paint your market into it, GOOD AND BAD, you are leading. You are saying both “these are the imminent dangers” and “this is the Promised land.” You see where the train is going and position your tribe to get on early. Myth-Breaking. The very POINT of being a Thought Leader is to wake people out of denial. Your market is deeply asleep in some area; profoundly conditioned. It’s your job to deploy an arrow that shatters their cozy world-view. 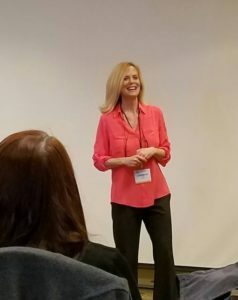 They are sleepwalking along, thinking they are doing the right things and thinking the right things…and you come along to say, “You’ve got it all wrong.” You break limiting and outdated myths. With all of my clients, I seek to find something that will shatter status-quo ideas—and that requires a lot of inquiry. Most people dance on the surface of their thinking, keeping the edgiest ideas out of sight and out of reach. Again, my clients and I develop this together as a single sentence to ensure cogent thinking and clear and succinct articulation. Core Beliefs: There exists in you a belief about how to live life and how not to live life. It comes from deep within—so deep, you may not know what it is consciously. What’s different about this belief that I have clients craft is that it is a message for all of humanity. It is their belief about humanity’s greatest problem and the solution. When you have a solution that would solve the world’s greatest problem, you truly step into the power of a leader—and particularly, an inspired leader with the great ability to influence. Things are different for you, so it is CRITICAL that you have this message when building a business, so it’s woven into everything you create, and that you have it in your marketing. In my 7-session program, I use it to brand my clients, as I’ve branded myself from mine. “Leaving the pack” is the essence of my core belief, and it is the pulse beat of absolutely everything I offer in business: I leave the pack as a leader, my programs leave the pack, and I make sure my clients leave the pack with one-of-a-kind brands and programs. That’s my brand and it came straight from this core belief, single-sentence message. New-Paradigm Solution: An Inspired Thought Leader is nothing if she doesn’t have a solution that breaks with the old way of doing things and thinking. This is a solution that has not been offered anywhere before—in part because it involves a proprietary process that only you have, but also because it is drawing on future trends that others have not considered and therefore takes people into new territory. Tribe Building: With this message, you build a potent, irresistible bond with your tribe—in your marketing–by causing them to feel special, outside of the “norm,” unique. You create an “us” and “them” construct that (unlike some leaders we know) does not emphasize the weakness of “them” but does emphasize the specialness of “us.” I have done that in this series by telling you that you are “transformation artists”—a different breed from all other entrepreneurs. I don’t say anything is wrong with “them,” but I make it clear you are different from them. In building this bond, you also assign your tribe a mission— something enormous to aspire to. It should be a big and vivid. Imagine being on the team in the 1960’s whose mission it was to put a man on the moon. Or to be at Elon Musk’s SpaceX, whose mission it is to colonize Mars. Make your mission as vivid as these. Again, this is where the Inspired Leader comes charging in, full-on, and influences her tribe by stitching them tightly together with special, common traits and an aspirational mission. All of these pillars must be woven into a coherent message: a well-crafted ARGUMENT. Think of your business messaging and brand as one giant, dynamic, alive, world-changing THESIS paper. LOL. You must be able to influence and persuade your market with a well-proven point. So, this is how you market. THIS is how you present. And this is what you SELL! Not your time, not your services, but a VISION of what your tribe can be–a new-paradigm proprietary methodology that sets you apart from everyone else and takes them where they never thought they could go. THESE are the elements that leave a lasting impression and change lives. And changed lives ACT. And taking action is the only result you are looking for as both a world-changer and a business owner. When you break their patterns and inspire them to go where they haven’t imagined going…they will act. Business is different for you! LEAD! But, of course, WILL you? As I’ve been saying, almost no one is delivering this kind of leadership message. Afraid of being rejected or criticized or otherwise uncomfortable, most people born to lead, don’t. They haven’t shattered their own paradigms yet, and so stay cozy in the middle of the curve where the crowd insulates them. Who can condemn “satisfactory,” and “good enough,” after all, when that’s what everyone around them delivers? Yet, in doing this, you are slipping deeper and deeper into the crowd. Where no one can find you. And where we can’t hear the IMPULSE within you any more that woke us up to this work. It’s just a faint, far-off pulse-beat. Is it okay with you to be where “good enough is good enough”? Is it okay with you to settle into the middle-of-the-curve and follow–when you have been called to lead? 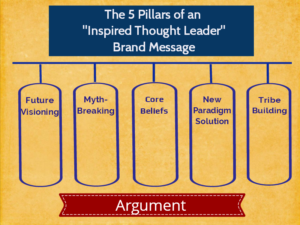 Now, go out, get your Inspired Thought Leader brand and message and deliver it in your marketing. And if you want my help, click here.